I've gone fishing exactly once, didn't catch anything. 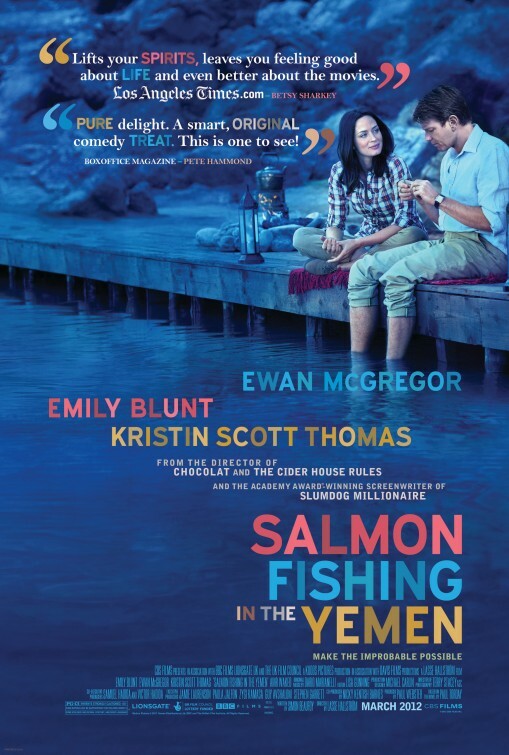 As a result, Salmon Fishing in the Yemen is almost a foreign film that shows a strange world where people enjoy standing in the middle of a river, throwing lines in order to catch fish. Much has been made of the title, which is apparently confusing or putting many off. SFY knows what it is: a sweet romantic comedy that puts an equal emphasis on romance and light comedy. Harriet Chetwode-Talbot (Emily Blunt) works for the wealthy Sheik Muhammed (Amr Waked). The Sheik has gained a passion for fly fishing, and he wishes to bring the sport to his native land in the Yemen. This is a difficult task given that Yemen is in the Arabian Peninsula. With total sincerity, Miss Chetwode-Talbot contacts Dr. Alfred Jones (Ewan McGregor), a fisheries expert and fly-fishing enthusiast himself. Dr. Jones thinks the whole thing both daft and a waste of his time and lets Miss Chetwode-Talbot know this. As it turns out, the idea of introducing salmon fishing in the Yemen catches the eye of Patricia Maxwell (Kristin Scott Thomas), Press Director for the Prime Minister. Desireous of a positive story from the Middle East, she orders Dr. Jones' superiors to put Jones on this major priority project. Dr. Jones is openly contemptuous of the whole scheme, while Miss Chetwode-Talbot tolerates his disdain with a barely concealed amusement. It isn't until Dr. Jones meets the Sheik and sees his passion and vision for the sport that Dr. Jones starts warming up to the idea (even if he still has reservations). The Sheik has faith that it will work, but Dr. Jones, an atheist, doesn't. The Sheik finally wins him over by drawing parallels between his faith both in God and this project and Jones' "faith" of how he spends hours wading in water with the hope of catching those elusive fish. The plans continue, but Miss Chetwode-Talbot hits a personal roadblock: her boyfriend, Captain Robert Mayers (Tom Mison), has been reported missing in action and probably killed in Afghanistan. Devasted, she just wants to sink into her own well of despair, but Dr. Jones, showing a bit of human warmth, brings her around. Now in the Yemen, Miss Chetwode-Talbot and Dr. Jones find an enthusiasm for this insane project, and their relationship growing from professional to personal to romantic. This causes conflict for the married Jones, who realizes that his life has been pretty stable but empty, with a wife who isn't evil but not the warmest. Jones, in agony, decides to leave his wife, and just as the project is about to open, we get a complication: Captain Mayers is found very much alive (much to Harriet's joy and Fred's sadness). In an effort to draw greater publicity, Mrs. Maxwell withheld the news so as to give the fishery opening a bit of a romance. Sadly, fundamentalists, who think salmon fishing in the Yemen is an affront to God, ruin the opening by opening up the dam, nearly killing everyone. After some time to think, Harriet realizes where her heart is, and ends her affair with Captain Mayers. Fortunately, a few salmon have survived the maelstrom, and the project can begin anew. Before the movie, I was unaware of Paul Torday's novel which was the basis of Simon Beaufoy's screenplay. However, if Salmon Fishing in the Yemen stuck close to the source material, on the whole the book must be a delight to read. The film is populated with real characters, people who are flawed but intelligent, and gives each of them their own moment. One should know from the get-go that Dr. Jones and Miss Chetwode-Talbot will end up together, even if both of them have partners, but the fact that they have to end their previous relationships to do so doesn't make them villainous or selfish. Instead, both of them realize they will be making someone else unhappy and they themselves are unhappy about that. However, they also realize that to stay with their partners would in itself make the other unhappy. Both McGregor and Blunt (two splendid actors, especially when given good material) play the relationship between Jones and Chetwode-Talbot (for most of SFY they address each other formally, adding a very British touch to the proceedings) as something that evolves, where their constant interactions beget inside jokes which beget emotional opening which beget true love. They both play the moments of comedy (such as when Jones crashes into a see-through partition or is almost condescending to her ideas) and drama (when Jones comforts a deeply grieving Harriet) with equal sincerity. Waked as the Sheik comes across as a man with far-sighted vision, whose private faith informs his life but is also aware enough to know what Jones and Chetwode-Talbot are not: that they are falling in love. Scott Thomas (again, an actress that really should be given more film work) brings a bit of the comic relief as the stern and determined Mrs. Maxwell. The intelligent decision of both Beaufoy's script and Lasse Hallstrom's direction is to move away from time to time from the Jones/Chetwode-Talbot story and give us a glimpse into Mrs. Maxwell's home life, where we see her as a hard-working wife and mother with her own set of family problems (most from children giving her a hard time). The positive thing about Salmon Fishing in the Yemen is that it's a simple story where there is no real adversary to the romantic side. It treats the love story and the fish story with equal respect. Even other things that normally are a bother (such as having split screens) flow by quickly and are used sparingly to where they work. If I would fault SFY for anything, it would be in the predictability of the story. Who here DIDN'T think Captain Mayers wouldn't come back at the most inopportune time? While it was expected, it felt a bit forced, as if the lovers needed one last complication to overcome. I also don't think anyone was surprised that just enough fish survived to start again. It brought to mind the ending of A Walk in the Clouds. Granted, I liked that movie too, but while I don't object to happy endings, something just didn't quite fit. 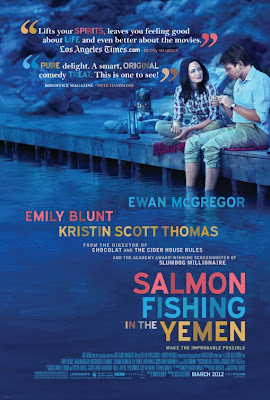 Salmon Fishing in the Yemen is a delight from start to finish, with great performances and a sweet story done well. It certainly is worth catching.